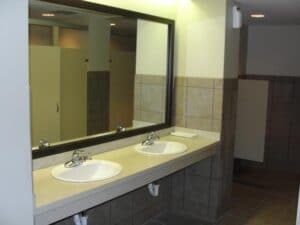 Once again, Titus Contracting has shown their professional remodeling expertise and craftsmanship by completing two new public bathroom renovations for a famous St Paul high rise. Many tenants and management staff commented on the speed, quality of work and the “Get’R Done!” attitude of Team Titus workers. The goal of this construction project was to renovate public restrooms adjacent to their large tenant party area. Remodeling work included demolition, new drywall, plumbing and electrical work. Then we installed new tile on floors and walls, fresh paint, framed mirrors and new laminate countertops. Like clockwork, Team Titus’ project management insured these renovations were completed with quality work, right on schedule. Titus Contracting… BUILDING EXCELLENCE FUELED BY YOUR DREAMS.